District Health Department #10 is always striving to improve the service it provides. Using a process of Quality Improvement (QI) is one way to do this. Each division at DHD#10 uses the QI process to identify an area that needs improvement and make improvements. 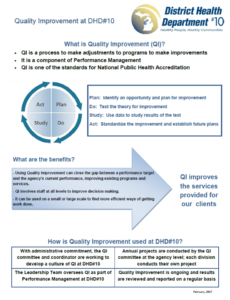 A QI Committee has been formed to improve agency-wide processes. QI involves staff, improves decision making, and identifies more efficient ways of getting work done. In turn, this benefits those receiving services at DHD#10.